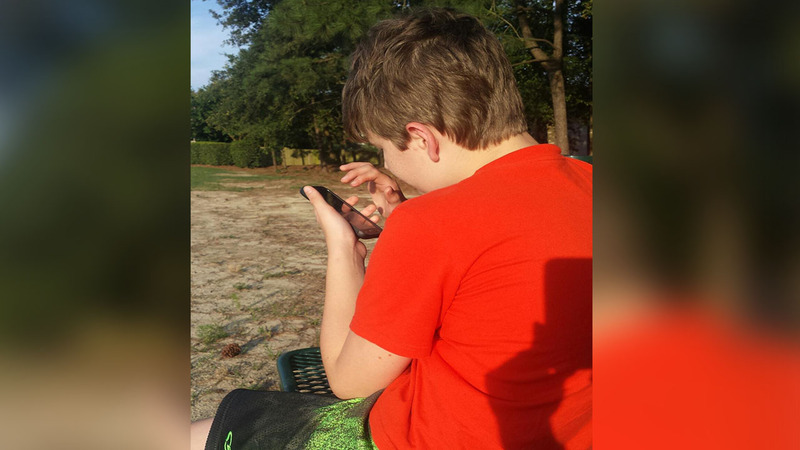 WAKE COUNTY, NC -- Pokemon Go has taken America by storm, and a mom in North Carolina, whose son is on the autism spectrum, says the game is completely changing the way her son interacts with the world. RELATED: So what is Pokemon Go, really? Stephanie Barnhill is a mother of two from Fuquay-Varina. Her oldest, 12-year-old Ian Thayer, has Asperger's Syndrome and Sensory Processing Disorder. "Ian is a really bright, funny, great kid, and as he's gotten older he's gravitated towards video games," Barnhill said. "I work in the video game industry. He loves what I do, but unfortunately, he would prefer to be alone and he does sit in the house a lot and watch YouTube tutorials, video games, and plays them all day long. "So getting him to be social, getting him to go outside, is always a challenging thing. He usually doesn't want to be torn away from the video games he's playing, so Pokemon Go has been fantastic for getting him outside. Barnhill works remotely for a company called Game Truck and heard about the app through her work. She said she doesn't really consider herself to be a video game player, but decided to give the app a try. "I downloaded it on my phone and thought you know, this would be a great tool for both of my children to use, so I downloaded it on their phone and then before you know it, all three of us are outside catching Pokemon," she said. "Initially, he was a little reluctant," she added. "I said 'Give it a try' and then I just saw his demeanor change. He started laughing and he started getting really competitive, really getting into catching the Pokemon." "He just started to get into it and now he's asking to go outside saying 'I need to go get more Pokemon balls,' or 'I need to go catch more Pokemon,' so he's taking more initiative to go outside and play than he ever has before," she said. Dr. Ricky Bloomfield, assistant professor in Internal Medicine-Pediatrics and director of Mobile Technology Strategy at Duke Health, said he agrees that Pokemon Go has the potential to be a positive thing for children with autism. He's very involved at the intersection of health and mobile tech as one of the team members behind the "Autism and Beyond," app, which is being tested as a screening tool for autism as part of ResearchKit from Apple. "I think it has done an amazing job getting people outside and interacting with the real world, when most video games keep us cooped up inside," Bloomfield said. "For autistic children in particular, it could possibly be used as a tool to encourage such exploration, provided it was done with supervision and in a safe environment." The game requires people to explore their surroundings in order to keep catching Pokemon. In the game, players need Pokeballs to catch Pokemon. To get Pokeballs, players must visit real-world landmarks that are designated as Pokestops in the game to load up. The game also designates certain real-world landmarks as Pokegyms where players can meet-up to battle their Pokemon. Barnhill said it's amazing to see her son Ian open up and actually want to go to parks like the Fuquay-Varina Mineral Springs because it's designated as a Pokestop and Pokegym, and because other gamers are also congregating around spots like for the same reasons, it's bring out a new, more social, side to her son that she's never seen. "There were a ton of people doing it out there too, so he's talking to people he otherwise wouldn't," Barnhill said. "I noticed he interjected in a conversation with some folks who were on their phone as well, so it's just been just an extraordinary experience, to take his love of video games and take it outside." Wanting to play outside in the middle of summer, when the temperatures might be soaring, is something Barnhill said her son would normally never do, but now as long as his phone is charged, he's ready to go and happy to talk to other Pokemon players. "He's going into the seventh grade and I really hope that this helps him be more social. I'm assuming that there's probably going to be some Pokémon Go clubs. He may even start one. He already mentioned that, so for him to take that initiative to be more social is just astounding," Barnhill said. "Now there's Pokemon meet-ups going on and we're going to one on Saturday, so he's going to meet other people that are playing Pokemon Go at the Convention Center in Raleigh, and so otherwise, he would not have wanted to go, due to the too many people making him uncomfortable, but now he's excited to go, she added. "I've noticed a huge change in him and I'm sure if I'm seeing that, many other parents are as well." Barnhill said it's also placed new value in getting exercise and taking a family trips to a local parks. "It's very addicting and so we've just gone to town with it. We've been walking more, going outside, going to parks. We went to the Kids Together Park in Cary - I probably haven't been there in three or four years, she said. "We went and checked out the Fuquay-Varina Mineral Springs, things that we've been driving past for the last three or four years and haven't taken notice . . . we're seeing all these great places that we've been driving past for forever." The features of the game that require players to go adventure out to spots, have also caused some controversy, compelling police departments to put out warnings against trespassing for Pokemon and driving and using your cellphone. Despite the controversy, Barnhill said she thinks the app can lead to much more good than harm for families with children who are on the autism spectrum, with the right parental supervision, and shared a message for other parents like her. "There have been some things in the news, some negative things about Pokemon Go, I would say for anyone to definitely give it a try," she said. "Parents download it on your phone if you're a little leery about letting your kids play it and set some boundaries. "Let them know where it's acceptable to go and where they're not supposed to go past and thing like that, but it's a great game. Just remember where you're surroundings are and watch where you're going, but I encourage your entire family to download this game and play it. Other folks have taken to social media to write about their experiences with Autism and Pokemon Go, including the mom in the Facebook post below, which has inspired thousands of people on the social forum site Reddit. Click here for more stories and videos about Pokemon.